Fairy Godmother Friday – Fairy Bucket Lists! Everyone has their bucket list items, but when you’re a Fairy Godmother you have your very own bucket list events! For this Fairy Godmother Friday, we asked Fairy Godmother Marissa what her dream events would be! When most people say “tea party” their minds go straight to the Victorian ages with big hats and fluffy dresses and with every detail being elegant and proper. Marissa’s ideal tea party is similar, but with her own added touch of fairy dust! While staying with the vintage theme, she would add an eclectic splash with mismatched cups and saucers, using teapots as vases for flowers and other floral decor, and feeding her guests with miniature appetizers, fruit tarts, and let’s not forget the delicious macaroons! Marissa has a knack for the Victorian age that we absolutely adore! Her second bucket list event would be that of a masquerade ball, preferably hosted as a New Year’s Eve event. Without holding back, Marissa would include vintage decor, upholding a strictly opulent atmosphere and without sparing a single detail. A band of some sort would be a must, and all attendees would be required to thread themselves in tuxedos and divine gowns! 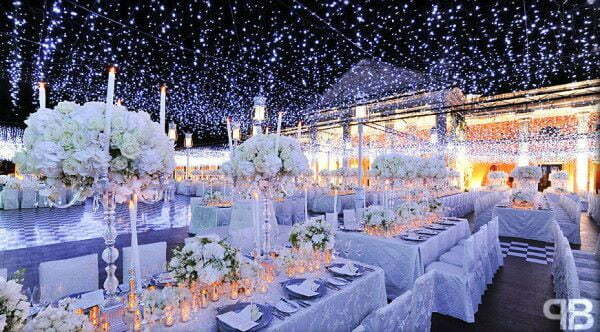 Who doesn’t love the thought of a pure white wedding?! Marissa’s dream would be to coordinate a “Winter Wonderland” themed wedding! Picture every detail in white, sparkling crystals and twinkle lights surrounding, and did we mention sparkles everywhere?? Using pine cones, twigs, faux fur and other natural elements to accent the event, Marissa even would use her fairy magic to have snow fall during the first dance! Fairy Godmother would LOVE to make your bucket list events a reality, contact us today!